This is the storytime that got postponed because of "Snowpocalypse 2016" last week. We didn't get quite the huge amounts of snow forecast (our friends in the mid-Atlantic region got the worst of it), but 7-1/2" of new snow on top of 1-1/2" on the ground from two days earlier is still a large amount for this area. But, by this week it was almost all gone; all that was left were a few small patches and piles from the cleared parking lots. In fact, the kids had already forgotten about it, until I reminded them! But, having had the experience of a big snowstorm the week before made our stories today that much more relatable for them. We started with our welcome song, then a very brief introduction, and our story song to lead into the first book, The Snowy Day by Ezra Jack Keats. I was in the first generation of children to enjoy this book, and I still have my original copy, though it is a bit worse for wear after going through five kids. I love using this book each winter, with it's simple yet engaging story, and wonderful illustrations. Despite it's simplicity, children find it very engaging, plus since most of the kids in this class are of color, it's nice to have a story with a main character that looks like them. I like seeing if they can predict what will happen when Peter hits the snow-covered tree with a stick, or explain why his snowball disappeared. I like using the 50th Anniversary Edition because it is a little bit bigger than the standard book. On my head, on my head. And that of course led perfectly into my "Five Little Snowmen". Since I did this as a rhyme yesterday, I decided to change it up and sing it today, to the tune of "Five Little Ducks Went Out To Play", especially knowing how this group likes to sing. After showing them all the hand motions and setting up the magnetic board, we sang it first, then did my game version. See my previous "Flannel Friday" post for full descriptions of all versions. 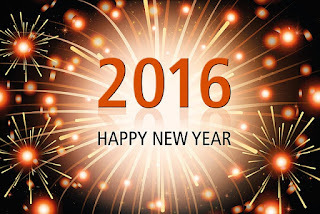 After that, it was time to settle down and sing our closing song, then pass out stickers and say "good-bye". To be perfectly honest, I wasn't particularly enthusiastic about storytime today because this year's class has been so difficult to manage (and it's not just me; the teacher reports the same thing). But they completely surprised me with how good they were! By the time we started our first story, they were settled and they stayed that way throughout the first story! They were engaged, they participated but did not interrupt (much, hey, they're 3), and at the end one little boy even said "Thank you" and asked for another story. They did a great job with the first flannel board and song, and though they were just a tiny bit restless at the start of the second book, once they saw the pop-up snowmen, they were fully engaged! The liked the melting snowmen, and absolutely LOVED my game version of it, and asked to play it again, but we were out of time. I just love seeing how they giggle with the suspense of waiting to see who will get melted next, and some of the more dramatic death scenes. So it turned out to be a really great storytime after all, and I felt a little guilty for not being too enthusiastic about it initially. The shorter, pop-up version of Snowmen... turned out to be perfect for them, and I'm thankful that I happened to have a copy at home! This was an unusual week for my Storytime-To-Go program. Normally, we go out 6 days per each 2-week rotation. 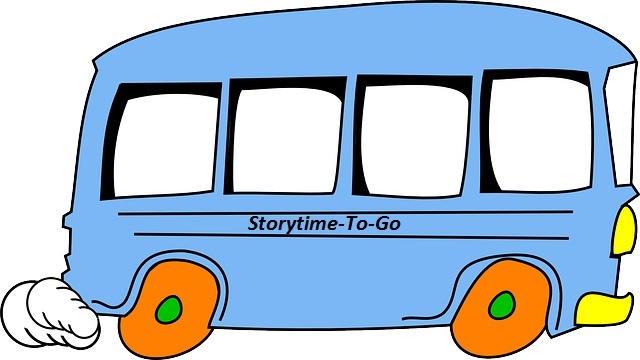 I am generally on the Storytime Bus every day it goes out, except for one or two days each month when we have a pair of volunteers that need to work together for transportation reasons. This time though, one day we were closed for a federal holiday, two days I had volunteer pairs scheduled so no need for me, then two days were snowed out, thanks to "Snowmageddon 2016". So that left me with only ONE day on the bus, which was disappointing (and ironic) because the theme was "Snow", one of my favorites. 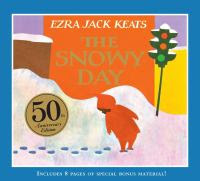 The Snowy Day by Ezra Jack Keats is of course a must-have classic. I had this in both the standard book and "big book" versions. I love the illustrations, and the simple story. Kids always seem to enjoy it, and can relate to Peter's adventures in the snow (if they have had the opportunity to experience snow themselves). I like to see if they can predict what will happen when Peter smacks a snow-covered tree with a stick, or explain what happened to Peter's snowball. Caralyn and Mark Buehner's Snowmen At Night came out right about the time my son was obsessed with snowmen. A boy notices his snowman doesn't look the same the next day and imagines that it is due to all the fun snowmen have a night while everyone is asleep. A cute, fun, slightly silly story with a rhyming text. 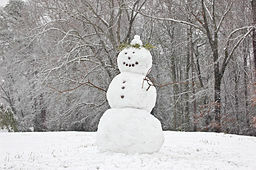 I like to see how many kids recognize that the snowman looks different because he has started to melt. Snowbaby Could Not Sleep by Kara LaReau and illustrated by Jim Ishikawa is a relatable story of little Snowbaby who is not ready to go to sleep, and comes up with one excuse after another. It has repeating lines of "Snowbaby could not, would not, sleep" and "I can't sleep" that the kids can say along with you, as well as counting snowflakes along with Snowbaby. It ends with a little Snowdoggie to keep Snowbaby company, and everyone gets to sleep. Snow! Snow! Snow! by Lee Harper is a story told mostly through pictures with little text about a family going sledding down a big, fast hill and ending up airborne, flying through the air with the geese. But, what goes up, must come down! Cute, but I think it could use more words to help with the flow of the story. Mouse's First Snow by Lauren Thompson is a cute, sweet story showing Little Mouse as he experiences snow for the first time along with Poppa. This story doesn't work quite as well with some groups as the other Mouse's First... stories that are more interactive. It is snowing, it is snowing. I need a hat, I need a hat. First, we did the traditional rhyme with hand motions, accompanied by the flannel board. We followed that with my game version, where the kids all stand up and are the snowmen, while I am the sun, walking around behind them as we say the rhyme. Then, when it is time for one to melt, I tap someone on the shoulder to tell them they have to melt (I usually do two at a time to save time). The kids LOVE this, the suspense of waiting to see if they will be tagged, and the drama of melting. 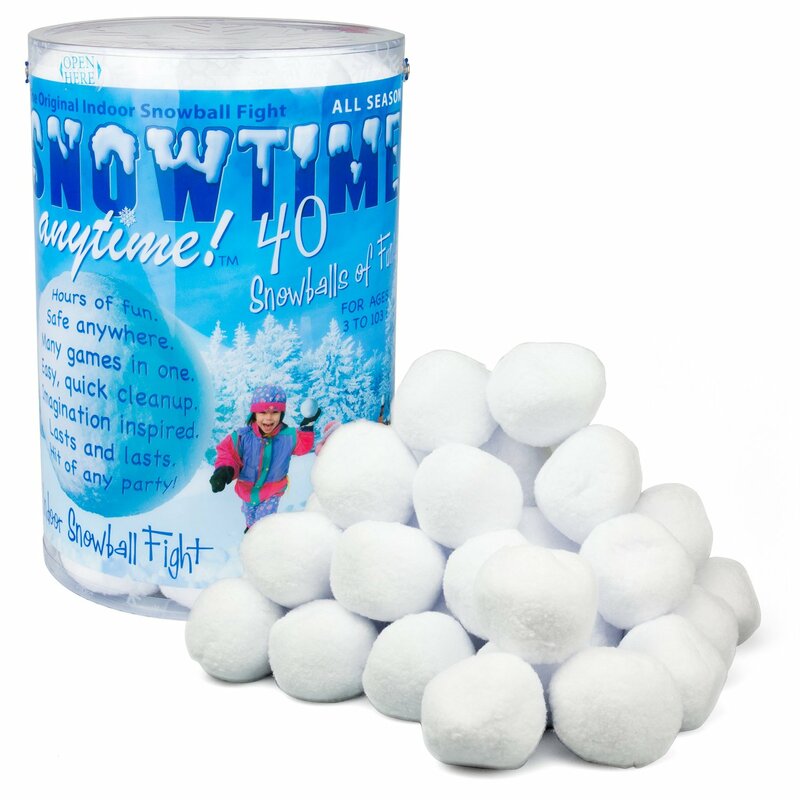 Let's have a snowball fight! Then, on the count of three they could start throwing the snowballs. I let it go on for probably 2-3 minutes (if we'd had more time and a larger space I would have given them 5-10 minutes). Then I called "Stop!" and collected the snowballs while we sang the last verse of the song, counting down from 10 to 1. The first two classes I had were younger and on the wiggly, chatty, and inattentive side. There is one little girl in particular in the first class that is always very disruptive with continuously speaking out and interrupting or trying to talk over us, which makes it very hard to get through the stories, so we (the volunteer and I) ended up having to shorten the stories and ending their sessions a little earlier, and did not try the snowman game or snowball fight. We had a ball with the second two classes, though! They are older and always well behaved, attentive, and participate. They had a blast with the snowman game and the snowball fights. It was cute to see when they would get brave enough to throw them at me, getting a mischievous gleam in their eyes. I really wish we had been able to give them more time. The last group did pretty well, too, but because they can get out of control sometimes, I elected not to do the snowball fight or game version of the snowmen and stuck with the traditional flannel boards instead. All the kids really liked Snowbaby Could Not Sleep, with the repetition and the cute little Snowdoggie at the end, and most enjoyed The Snowy Day and Snowmen At Night, except for the younger kids who had trouble paying attention to anything. I realized I need to find some short, yet very engaging snow books for these younger classes (this is always a challenge!). I had a few shorter ones, but they were all rather boring and didn't really engage them. I should be doing storytime right about now, but thanks to the big storm hitting our area today both the daycare I was supposed to visit and the library are closed. In fact, I haven't done a storytime all week, which feels really strange now that I'm used to doing 15 a week! Monday was a holiday, then Tuesday I had a pair of volunteers who prefer to work together covering it [normally it is me and one volunteer, but we have a couple of pairs left from when the program was all volunteer] so I worked in the building, then Wednesday it was cancelled because of snow as well. Ironically, the theme this week was to have been "Snow". So thanks to "Snowpocalypse 2016", I am resigned to being snowed in for a couple of days. We have plenty of bread, milk, and toilet paper in the house, and other food as well. I have more than enough to keep me busy with a stack of books to read and review, and of course I could always do housework. But, my biggest task will be to write a graduate admissions essay! Yes, I have actually decided to bite the bullet and apply to library school to get an MLIS! I have felt for the last two years that I had missed my calling as a children's librarian, but thought it was too late. I had previously looked into getting my MLIS at the library school in my area, but the tuition was way too high. I just couldn't afford it and didn't feel it was worth investing $25,000 in a degree considering in reality it might never pay off because of the over-saturated job market here (relocating is not an option, at least for now) and my age. I likely wouldn't live long enough to ever see the title of "Librarian" after my name. Plus, I didn't care for the curriculum. It did not seem very practical or flexible, with so many required courses, almost no electives, and very heavy on theory and tech and little on practical skills needed day-to-day working in a public library. So I resigned myself to being a paraprofessional, and I was pretty okay with that. So, what changed my mind? First off, I suddenly realized that when my husband retires, we will lose our health insurance, so I will really need to have some kind of full-time job with benefits by then. Second, I had planned on taking at least a couple of classes in library science anyway so I could qualify for state paraprofessional library certification. Then, I just happened to find out about an MLIS program in another state that is almost half the cost of the one here. It is all online (aside from an initial in-person orientation), ALA accredited, and the curriculum is much more practical and flexible than the one here. So, I started re-considering, and after looking at how much money I've been able to save since my promotion last summer, I realized I could afford it if I just take 1 class each semester, including summers. At that rate I would graduate in December of 2020, which is still a few years before my husband plans to retire. I am realistic; I do know that getting a full-time professional librarian position would be a very long shot at the system where I'm currently employed. But there are at least 4 other county libraries within a 30-minute drive of where I live now, and I would be fine with any other full-time position, such as a children's assistant, programming specialist, outreach, etc. Once my husband retires, relocating is an option as well, and I would not be opposed to moving somewhere that others might consider "less desirable" in order to get a full-time professional position. But first, I have to get this darn essay written and all my other application materials submitted, and get accepted. Wish me luck!! 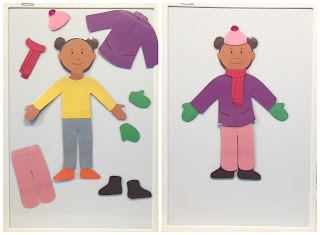 We had some very cold temperatures and our first snowfall of the year during this rotation, so the kids were very aware that it was wintertime, even if they weren't always able to verbalize it. 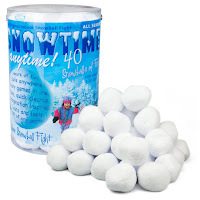 Since we have a "Snow" kit that focuses on fun things like snowmen, snowballs, and sledding, the "Winter" kit focuses more on trying to stay warm in winter. We used a number of books, though there were 4 or 5 that I tended to use the most, using 2 or 3 for each group. We had a few different songs and activities and generally did 2 for each group, in addition to our "story song". 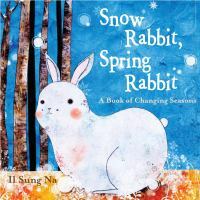 Snow Rabbit, Spring Rabbit by Il Sung Na is one of my favorite winter books. Even though it is short and simple, the charming illustrations really seem to hold even the older kids' attention and it is perfect for a younger audience. 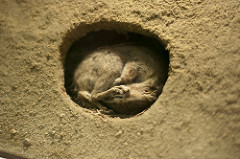 I particularly like how it demonstrates all the ways animals survive winter: hibernation, migration, and adaptation. Duck At The Door by Jackie Urbanovic tells the story of poor Max, a duck who enjoyed spring and summer so much that he though he would like winter, too, so he stayed behind instead of flying south with his flock. Of course he soon finds that winter is very cold and lonely. Fortunately, Irene welcomes him to stay with her and all her pets, with some funny consequences. I also like to use this story to illustrate how they should never open the door when someone knocks, but should go get their grown-up, just like the animals in the story got Irene. Froggy Gets Dressed by Jonathan London is a classic. Not only is it funny with Froggy forgetting critical items of clothing, including his underwear, kids can relate to Froggy's excitement about the snow and difficulties getting dressed. I like to introduce the book by first talking about how frogs and toads normally sleep all winter. You are guaranteed laughs and giggles at the mention of underwear! In Bedtime for Bear, by Brett Helquist, Bear is ready to go to sleep for the winter, but his friends are making too much noise outside for him to get to sleep. At first Bear is angry, but soon finds himself joining in the fun and the friends spend one last day playing together in the snow and Bear can finally go to sleep. In Time To Sleep by Denise Fleming Bear realizes that it is almost winter and tells his friend Snail, who tells Skunk, who tells Turtle, who tells Woodchuck, who tells Ladybug. Then Ladybug decides she needs to tell Bear, not realizing Bear already knew. So she goes to Bear's cave and wakes her up just to tell her it's time to go to sleep! Older kids will get the humor, but younger kids may need a little prompting. In Karma Wilson's Bear Snores On, we see how Bear first met all his friends after they each take shelter in his cave while he is asleep for the winter. The story is cute and has a nice rhyme and rhythm that helps draw in the audience and keep them engaged. And of course Jane Chapman's illustrations are beautiful as always. Brigitte Sidjanski's Little Chicken & Little Fox tells the story of an unlikely friendship between a chicken and a poor little lost fox out in the freezing snow. The story offers the opportunity to discuss how we can be friends even with people who are very different from us. Me Too! by Valeri Gorbachev is a short, simple story that might seem a little dull at first glance, but it works really well as a participatory story. Best friends Bear and Chipmunk are enjoying a day of winter fun playing in the snow. Every time Bear makes a comment, Chipmunk chimes in saying "Me, too!". Tell the audience that they are playing the part of the chipmunk and assign them the roll of saying all the "Me, too"s.
Hibernation by Anita Garneri is a non-fiction book that I like to use to show pictures of different animals hibernating (or preparing to hibernate), so that the kids can see all kinds of animals hibernate, not just bears. Kitten's Winter by Eugenie Fernandes is a very short and simple story, following a little calico kitten's travels on a winter day, showing various wild animals. I find it a little boring, but it's good in a pinch when you need something short and simple. Let's sing a winter song, let's sing a winter song. 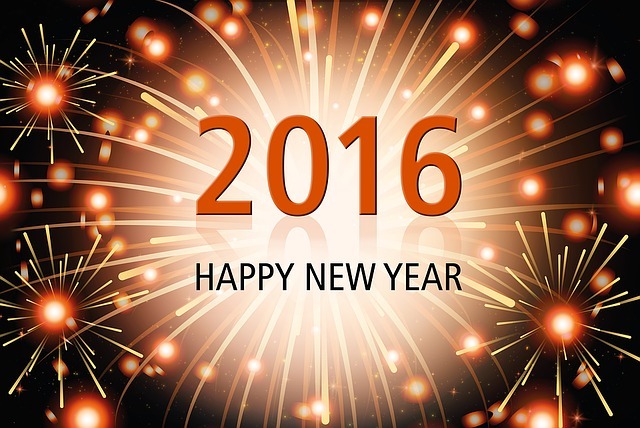 The days are short, the nights are long. Let's sing a winter song. The winter wind is cold, the winter wind is cold. It freezes nose, ears, and toes. The winter wind is cold. Put on your coat, your hat, your gloves. Keep me warm, keep me warm. Other verses: hat on my head, scarf on my neck, coat on my body, boots on my feet, etc. The weather's getting cold, so bundle up, bundle up, bundle up. The weather's getting cold, so bundle up. Winter's coming soon. The bears in the cave sleep all the time, sleep all the time, sleep all the time. The bears in the cave sleep all the time. Winter's coming soon. The squirrels in the trees gather nuts, gather nuts, gather nuts. The squirrels in the trees gather nuts. Winter's coming soon. The frogs and the toads go deep in the mud, deep in the mud, deep in the mud. The frogs and the toads go deep in the mud. Winter's coming soon. The ducks and the geese go flying south, flying south, flying south. The ducks and the geese go flying south. Winter's coming soon. The people in the town wear hats and gloves, hats and gloves, hats and gloves. The people in the town wear hats and gloves. Winter's coming soon. I also had this set of mittens that I used for matching and sorting, and also had a couple of songs that went with them, which I described in detail in yesterday's "Flannel Friday" post. I found that I ended up using Snow Rabbit, Spring Rabbit with almost every group. It's short and simple enough that even my youngest kids could pay attention to it, but it also held the interest of the older kids, too. I really like how it shows not only hibernation, but also migration and adaptation. I also used Duck At The Door, Froggy Gets Dressed, and Bedtime For Bear frequently as well, and the other books only occasionally. Of course Froggy always gets big laughs and giggles as soon as you say "underwear". Overall, I would say most of the books were well-received, though Kitten's Winter was on the dull side. All of the songs worked well, and the mitten activities, though I was surprised that most of the groups seemed to have a little trouble with the rhyming concept, so I will have to make a point to incorporate rhyming activities and point out rhyming words more in the future. They really seemed to like each getting their own mitten and being able to bring it up and put it on the board. The only problem was that for some reason some of them are compelled to pick at anything you give them, and pull the magnets or embellishments off, so by the end I had to repair several mittens. I had several funny comments during the course of this rotation. One child cautioned us about not eating the yellow snow, another brought up having to get flu shots, and of course there are always several funny underwear comments with Froggy Gets Dressed. One morning it had started snowing pretty heavily, which worked great with the theme, but one group was so overly excited about it that they couldn't contain themselves. They started out okay, just a little wiggly and chatty, but as soon as my volunteer started reading the second story, the kids just went crazy. I've never had a group get that out of control before! They were all over the place, jumping around, climbing on chairs, etc. Even with four adults (myself, my volunteer, our driver, and the daycare worker) we couldn't manage to wrangle them. So we gave up on the book, sang a quick song, and sent them on their way. But then the next day the group that got out of control during the very last Christmas storytime were perfect angels. That just shows how variable kids can be and how things outside of our control can have a profound affect on their behavior. So you can't take it personally or let it bother you; sometimes a group is just having a bad day, and it's best just to cut it short before everyone gets too frustrated, and next time will be better. Red ones, yellow ones, blue ones, too. They're my favorite mittens, and they are ____! Jack/black, sink/pink, kite/white, cold/gold, and fan/tan. I like that this rhyme works on both color recognition and rhyming words, and you can do as many or few verses as you want. I give each child a mitten, making sure I only use the colors that I have rhyming words for. Then when their color is guessed, they bring it up and put it on the board. One red mitten, what'll I do? I'll find the other one, then there'll be two! This song will work with all colors, and again, I pass one of each pair of mittens out so they can bring them up as I get to each of their mates. Frequently I just use these for matching and sorting, discussing the different attributes of each mitten. First, I pass out one of each pair. Then I will hold one mitten up and ask the group what color it is, next I ask what the design on the front is (it's interesting to see what the kids come up with for some of them, like the peace sign, which they often call a pretzel), and what color the design is. Then I will ask if anyone else has a "red mitten with a blue flower", for example, and if they do, they bring it up and put it on the board beside mine. I find that most kids really like activities where they get their own piece to contribute later. Sometimes, I may do more broad categories, like "Does anyone else have a mitten with an animal on it" and group them based on type of design, color of design, etc. Sorting and grouping is both an early literacy skill and a pre-math skill. Plus it allows for a lot of interaction with the kids. Another option with a larger group is to pass out all the mittens, and let them find the person who has their mate. You could make it more challenging for the older kids by having pairs of the same color, but with different designs. These are quick and easy to make, and the kids really seem to enjoy the activities. One word of caution, for some reason some of them are compelled to (1) try to pick the stickers and magnets off as soon as they get them, or (2) put them all over their mouths & noses, so be sure to give explicit instructions NOT to do those things before you begin passing them out. To see more Flannel Friday posts from other bloggers, go to this week's Flannel Friday Round-Up hosted by Lauren at "The Dilley Dally", or visit the Flannel Friday Pinterest board for tons of inspiration. For more information about Flannel Friday and how to participate, visit the Flannel Friday site. Last year I did a more general "Animals In Winter" storytime, and right now I am in the middle of a 2-week rotation of "Winter" storytimes with the Storytime Bus, so I decided for my traditional preschool storytime I would do something a little more focused and "science-y" (remember, former biology teacher here) and talk about how animals survive winter by hibernating, migrating, or adapting. I know these concepts would be a bit over the heads of these kids, but it certainly wouldn't hurt to give them some early exposure to the concepts and vocabulary, either. We started off with our welcome song, then I explained that we were going to talk about how animals survive in winter. I asked them how people stay warm in winter, and they promptly said by putting on coats/jackets. I compared this to how some animals grow a thicker winter coat of fur, and that was an example of "adaptation". Then I asked if people stayed inside more in the winter, and liked to curl up under warm blankets and sleep, to which some said "yes". I explained how that was similar to how bears and other animals curl up in their dens and sleep all winter, which is called "hibernation." Then I asked them if they knew anyone who like to take a vacation in Florida in the winter, and explained that some birds flew south in the winter to stay warm also, and that this was called "migration". I had them repeat each word as I introduced them. Then, we did an action rhyme to help quickly reinforce those ideas, and help get them all focused. After that, we sang our "story song", which I extended for a couple of extra verses to try to get them to settle down and stay focused. Then we read our first book, Snow Rabbit, Spring Rabbit by Il Sung Na. I love this sweet, simple book with it's unique, charming illustrations and how it shows not just hibernation, but migration and adaptation, too. It is fairly short with a small amount of text, and can be made interactive by letting the kids name the animals. Most of them are always amazed at how the snowshoe rabbit (technically a hare) changes from white in the winter to brown in the spring. I also made a point to say whether each one was an example of hibernation, migration, or adaptation. 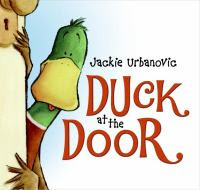 Our next story, Duck At The Door by Jackie Urbanovic, touched on migration, or more accurately, what would happen if a duck didn't migrate and fly south for the winter like he was supposed to? Max had so much fun in spring and summer, he though he'd like to stay for winter, realizing too late what a mistake that was. Luckily, Irene and her household of pets took him in for the winter. I love the picture of the sad, cold, lonely little duck trudging through the snow. This is a cute funny story, but I do like to use it as an opportunity to reinforce that you do not open the door to strangers, and instead you should go get your grown-up if someone knocks at the door, especially in the middle of the night. The kids all love the ending when Max returns the next winter, with his whole flock! I originally had planned another song about hibernation and a third book, Brett Helquist's Bedtime for Bear, but it was obvious at this point that we had all had enough and the kids just couldn't handle anymore today, so we sang our closing song, handed out stickers, and I called it a day. It was clear I had been a bit over-ambitious in my planning for this storytime. It started off pretty well, but by the second book I was clearly loosing them. Partly because of the holiday break, but partly because this group just doesn't seem like they are ever going to settle down! They are the most chatty, wiggly 3-year olds I've ever seen! I am going to have to re-think my usual planning, and plan for them like they are 2-year olds instead, and stick with songs and rhymes, and just two shorter books and just do interactive books. It's a shame, because they are missing out on some good stories. Snow Rabbit, Spring Rabbit was a perfect choice for them and they did very well with it. They were all amazed at how the snowshoe rabbit could change colors with the seasons, and several said they wished they could do that, too. I just wish I'd been able to find some other good-but-short & interactive books as well. They did pretty well with the songs and rhymes, though a few got a little too rambunctious and one little girl purposefully hit another because she had accidentally touched her while flapping her arms with the song, so I had to send her to sit with the teacher. I just can't get over the difference in behavior and maturity between this 3-year old class and the one with the same classroom and teacher last year. They are going to be an on-going challenge, I can tell. I did a winter themed storytime last December that focused on staying warm in winter, mostly about how animals have adapted to deal with winter by hibernating, storing food, migrating, growing winter coats, etc., wanting to save the focus on snow until January when we typically get it in this area. The timing worked out perfectly! We had a fairly big snow (for our area) the weekend before, so by the time I did this storytime, the kids had had a chance to experience snow and it was still on the ground. We started with our opening welcome song, then talked about the snow and all the fun things you can do in the snow. Of course they were all very eager to talk about the fun they had playing in the recent snow. After that, we transitioned into the first book by singing our "story song". For our first book, I chose a classic, The Snowy Day by Ezra Jack Keats. I was going to use my childhood copy, but when I dug it out it was not in the greatest condition after going through 5 kids, so I opted for the 50th Anniversary special edition instead since it is bigger than the standard book. This book has a simple sweet story of a boy exploring his snow-covered surroundings. I chose this partly for nostalgia, but also because it features an African-American child, and I like to see if the children can predict what will happen when Peter whacks the snow-covered tree with a big stick, or if they can figure out what happened to the snowball in his pocket. After that, a simple song that would give them a chance for some movement. In the air, in the air. 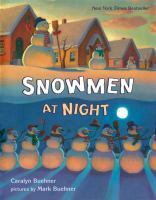 The onto some silly, snowman fun with Caralyn Buehner's Snowmen At Night. This is a fun book that poses the question, "What do snowmen do at night?" after a boy notices his snowmen always look different the next day. It has rhyming verses and a good rhythm, plus charming illustrations depicting the goings-on the boy imagines. I chose this because its fun, and I like to see if the kids can tell me the real reason the snowmen look different the very next day. 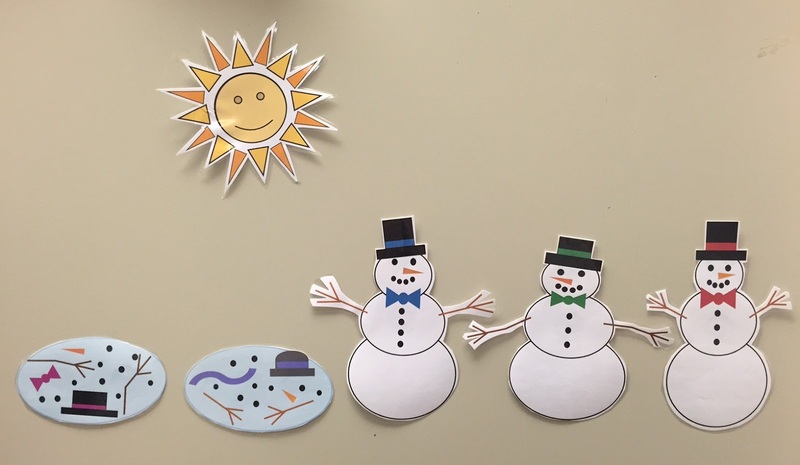 Next we did a "Five Little Snowmen" rhyme with a magnetic board and snowmen and puddles I drew using the "shapes" tool in MS Publisher, inspired by the one on Miss Mary Liberry. For a complete description with rhyme, more photos, directions, and printable files, see my Flannel Friday: "Five Little Snowmen" post. The night before my storytime I had a sudden inspiration to turn this rhyme into a game, by having the children pretend to be the snowmen and me being the sun, and tapping them on the shoulder to tell them it was their turn to melt. So first we did it the traditional way, then followed that by the "game" version. This turned out to be a lot of fun! 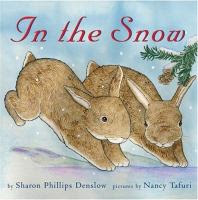 For our third and last story we read In The Snow by Sharon Phillips Denslow, illustrated by Nancy Tafuri. I liked the idea of doing a book that showed different animal tracks in the snow, and I thought this one did the best job of showing different animal tracks with simple pictures and text that were suitable for this age group. After that, we finished up by singing our regular closing song. 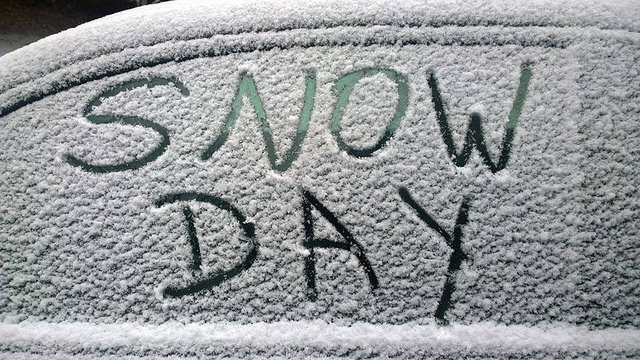 I had about 10 kids and it was a very good thing I had planned on doing "Snow" today, because after our recent snowstorm, that is all they wanted to talk about! They were so excited about the snow, which kept them engaged, if a bit talkative. They liked all the stories, and I was pleasantly surprised that several figured out what happened to Peter's snowball and some even recognized that the snowmen looked different the next day because of melting. The kids were amazed when I told them that *I* had read The Snowy Day when I was their age. This was the first time I had ever used any kind of storyboard with them, and they were very intrigued by the "Five Little Snowmen" board. They absolutely LOVED when I turned it into a game, giggling at the suspense of who would be tagged to melt next! I highly recommend trying it this way if you have the space. I was a little surprised that they didn't get into dancing around like snowflakes with "Dance Like Snowflakes"; I had thought they would really enjoy twirling around like floating snowflakes, but they were very lackluster about it. Aside from the annual resolutions to try to eat better, work out, and get in shape, I thought I'd take the time to write out a few storytime resolutions as well. Some of these are inspired by the workshop with early literacy expert Saroj Ghoting I attended recently, some are just things I would like to try or feel need to be done. the effort to use them more. (3) Develop/finish 3-4 more new storytime kits for my storytime-to-go collection. songs, rhymes and fingerplays; feltboard stories, and other activities. good for the younger and more wiggly groups and more my style. other storytimes in my system. So, these are my resolutions, and I have a few others not related to storytime (read more, work on reader's advisory, and take a class). What are yours?